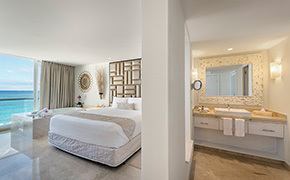 Palace Resorts has announced the reopening of Playacar Palace in Playa del Carmen, following a US$14 million multi-phase remodel. Since opening its doors to guests in December 2005, this is the hotel’s second phase of renovations, which included upgrades to guest rooms, the lobby, front desk, restaurants and lounge areas. Each of the resort’s 201 rooms now boast new décor, modern furnishings, enhanced showers and vanity areas, Lavazza coffee makers and advanced jets added to the in-room double whirlpool tubs. Additionally, the property’s existing walk out suites now feature a private terrace and suite access is now readily available via state-of-the-art wristbands. 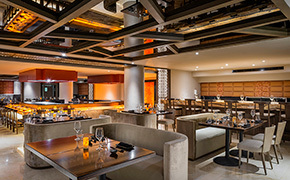 The resort’s dining spaces now have new looks and menu offerings, and the brand also recently announced an exclusive partnership with Certified Angus Beef that will see it only serve beef with that designation. Adding to the culinary experience, Palace Resorts has also formed a partnership with pastry chef, Antonio Bachour. 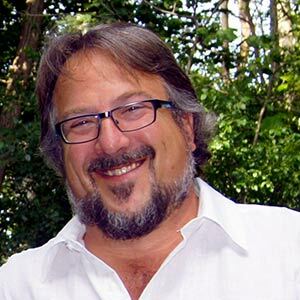 “As a brand, we are always looking to reinvent ourselves and elevate each part of any guest’s experience. It’s not only about being better but also about offering our guests a completely unique experience, while offering the highest quality of standards,” said Gibran Chapur, executive vice president of Palace Resorts.